I said to my musician friend, about a month ago : " I do need to buy a new guitar, and I see it white". He replied that, choosing an instrument it is not a matter of color, but of sound. Since I am an artist, I paint everyday, colors are me, and I am the colors. I found her, got her, called her BIANCA, and now we make music together. Choose the companions that make you happy, exalted, vibrant. Even if they are white! GATKA . THE TWIRLING MARTIAL DANCE. Move with the spirited beat of your heart, harmonize your inner sounds with the spheres. Fly high with the devotional songs of the 10th Master. A full day meditating with 600 people , all dressed in white, so contained and present, aware of the sacred space and energy we were in. Waho! The Unison created during the chanting of Sat Nam, it was for me experiencing the sounds of the Spheres, all going at different speeds, yet in harmony with all. This was for me the 100 some tantric experience. Always different, as I am different each and every time. Always uniquely perfect for where we are, deepening into our essence, cleaning more layers from the subconscious. "The Beauty of White Tantric Yoga is that it is subtle, it is exalting and it works to give you the mastery of life"
"Make yourself so happy so that when others look at you they become happy too." Find the mantras here at CD Baby. I was blessed to have recognized my Spiritual Teacher this lifetime. 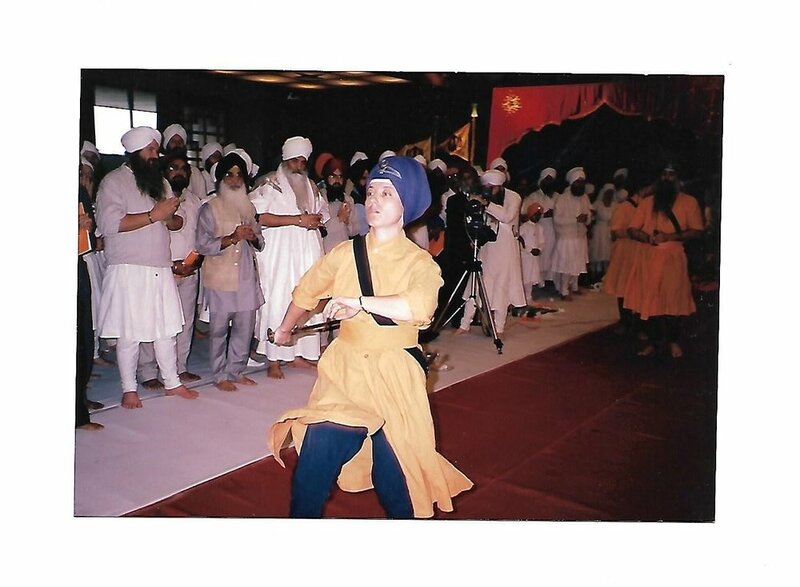 Yogi Bhajan always encouraged me to sing and spread the Naam, to keep up with my practice, and teach Kundalini Yoga and Gatka. "Accept what is yours and reach out to take the hand of destiny. Be strong and claim what is rightfully yours." the Princess of the Magnificent Creator. This devotional piece is a sweet prayer, for children and adults alike, to relax under Guru Ram Das’ protection. Evokes compassion, allows us to surrender to the Divine, and opens the heart. Yoga and martial art are a path to experience great energy and indescribable bliss. The Warrior is in the house! Is the part of Kundalini Yoga that makes you sing. in body and mind, I get in touch with my Real Identity. Please sit whit the spine straight, on the floor or on a chair. Bring your hands together in prayer pose in front of your heart. Keep your chin slightly in, eyes closed, concentrate at the third eye. Breathe calm, long and deep, through the nose. Continue for a minute. Nowget ready to chant the mantra Sat Nam (True Identity). The sound Sat will be long, the Nam shorter. Inhale deep, and with the exhale chant with all your heart Saaaaaaaaaat Naaam. Keep up chanting this mantra in the same fashion for a few minutes. At the end inhale deep, hold the breath, then exhale and relax the hands in your lap. Congratulation. You have done it! Or, you may go to the Service page, and book a session with me. Calling on His Name "Guru Guru Wahe Guru Guru Ram Das Guru" we ask for His healing, caring, loving presence in our lives. 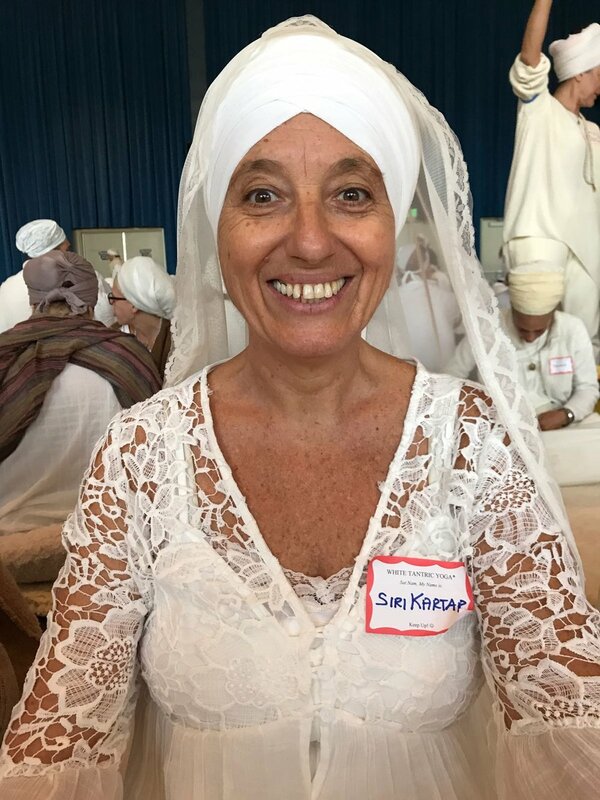 Guru Ram Das' So Purkh meditation recited by Siri Kartar Kaur. There is one God. By Guru's Grace, women chant during the ambrosial hours to call the name of God to manifest here on earth; for our husbands, children, brothers, fathers, and friends. A prayer that protects and uplifts the men in our lives. This video is made at the Guru Ram Das Ashram in Los Angeles. The Lord Himself is the Master, and He Himself is His own servant. O Nanak, how insignificant are mortal beings! O Lord, You are the One Primal Being, All-permeating. You Yourself are the Giver, and You Yourself are the Enjoyer. I know of no other than You. what Glorious Praises of Yours should I speak and chant? Unto those who serve, unto those who serve You, slave Nanak is a sacrifice. O Dear Lord, those humble beings dwell in peace in this world. the noose of Death is cut away from them. all their fears are dispelled. are absorbed into the Being of the Lord, Har, Har. slave Nanak is a sacrifice to them. and adoration; they practice penance and endlessly chant in meditation. they perform religious rituals and the six ceremonies. ho are pleasing to my Lord God. there is no other as Great as You. You are the One, age after age; forever and ever, You are One and the same. You are the Eternal, Unchanging Creator. You Yourself shall destroy it all. Servant Nanak sings the Glorious Praises of the Creator, the Knower of all. Finally I feel myself today, as I can acknowledge that I am vibrating within the strength of my identity. Why? Because I simply woke up in the Amrit Vela, the ambrosial hours before dawn, to do my practice of yoga, prayers, chanting. Discipline is necessary, Its such a giver discipline! It becomes our second nature, we just do it. I see it very clear now, through my journeys, my changes, upgrades, revolutions...thank God for discipline, that allowed me to perform perfect yoga and meditation sets every morning, 3 years ago when I was so sick that during the rest of the day I could only sit in silence, or lay down, like a zombie. Small miracle, I would say. It was my touch stone, at a moment of illness when I could not hold on anything. The physical imbalance effected my emotional, mental, spiritual inner world so powerfully, to the extent that any thought or image would give me nausea ,depression, anxiety. I hold on my practice, that gave me resilience, offered me stamina even when medically was not possible to detect any trace of it! It saved me, as always does. Gratitude, gratitude to the practice, the discipline, the resilience in me, such a gift the Creator instilled in me! I only have to keep it alive, so she can keep me alive.